As a Catholic community, we believe that our communal worship is one of the primary modes of experiencing God's real and effective presence in our lives. 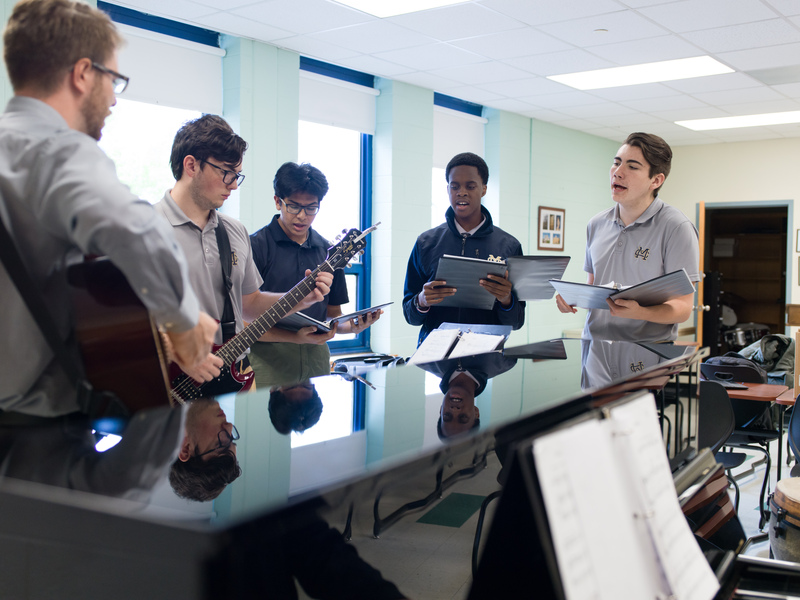 At Malden Catholic, we engage our students, faculty, and staff in regular worship in a number of ways throughout the school year. A treasured expression of our devotion to Mary, the Rosary is prayed every Wednesday of the school year at 7:25 AM, and at a special school-wide service during the month of October. When weather permits, students, faculty, and staff pray the Rosary in Our Lady of the Rosary Courtyard. Eucharistic Adoration is offered on Friday mornings periodically throughout the school year. All members of the MC community are encouraged to stop by for a moment of quiet prayer. Students, faculty, and staff are all welcome to take part in our music ministry, which provides liturgical music for all of our Masses. No prior background in choral singing is required, just a positive attitude and a desire to help lead our community in musical prayer! For the 2018-2019 school year, anyone interested in being a part of music ministry should contact Ms. Anne Grant at granta@maldencatholic.org. Malden Catholic maintains a dedicated group of student volunteers who serve as ushers, lectors, and Eucharistic Ministers for all of our liturgies. All students receive appropriate training, and no prior experience is necessary. Please stop by Campus Ministry to sign up!